I like the casual nature of the custom maps in Star Craft 2 . Perfect to fit in before/after raid times. 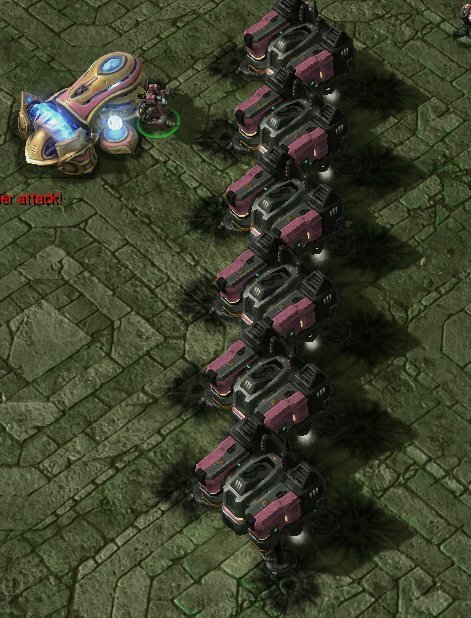 The Nexus War is one of my favorites, a 4v4 Map, 4 people on each end of the map, and a Nexus base to protect. The map is also divided into two ‘roads’ and depending on what side of the Nexus you build on, your units will run down that side of the ‘road.’ The idea is to have two on each road so the forces are even. You start with 100 minerals and limited build choices between Terran, Zerg, and Proton, you can build 2 x Zerglings or 2 x Marines or 1 times a better unit. You have to build quick. Get your units on the ground and in the build cycle as soon as you can. There is a tech progression you must follow, eg build Halions, before you can build a thor or a medivac, and so on. The units you build earn you an income which gets paid to you in minerals every 2o secs , and kills get you minerals too. It is slow going in the beginning but you can be over run rather quickly. Once you build the units you cannot control them. They run in a straight line down the path. 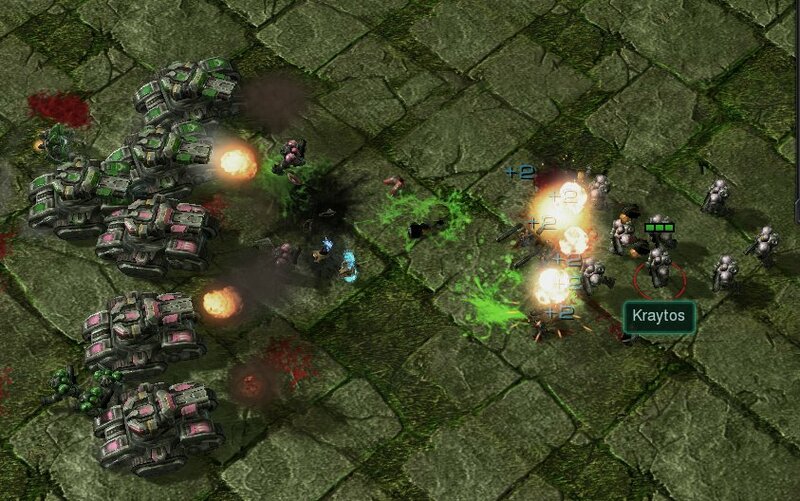 Their aim is to kill the Nexus which is found at the opposite side of the map, the idea is to overwhelm the ‘enemy’ side with units, and your mindless drones will eventually start hitting the nexus. Each player gets one nuke to use. This is best used defending your base, or your side of the map if they are getting over run. Don’t bother nuking the enemy base. You can also build proton stationary cannons to protect your base, but they are 150 minerals each – so only build if you them if you have the spare minerals and are in need. They get targeted before your Bases though so it could be a complete waste. You don’t need to build all Terran, all Zerg and so on, you can mix your units up, and I traditionally build about 4 or 5 marines, a suicide bug one ( can’t remember the name) because they splash acid and clean up pesky marines quite easily if they get to touch them) a proton force field flying unit to buy my marines some time, one Halion (because I have to to get to my Medivacs and Tanks) one Medivac, then tank, tank, tank tank, and some air units if the game goes on long enough and a thor if I have the spare minerals. In early games I made the mistake of sending my units one at a time as they were built – this is bad. Some players will build 10 x marines only, and that strat is only affective if you can get your 10 in sync. If you delay the building cycle too long, you miss out on kills, thus resources, but delaying all builds so all your 10 marines come out at once. Your going to smash the single units that your opponents are dribbling out – if you can get your 1st two in Synch by building them at the same time when you start. It’s quite easy to get any further ones you build in Sync by delaying the build on your new unit until the other ones have spewed out their units. That way they start their build rotation together, and your not losing valuable time. You can also synch them by double clicking on the units of the same type, and canceling the builds until they all start the cycle together. I don’t like the 10 x marines, you have the option to upgrade them by 15 health points, but that costs 150 minerals and I can make a tank for that. They are good foot soldiers, but heavier artillery will help you win. If one side is weak, or doesn’t know what they are doing, there is only so much covering you can do and instruction to offer. I tried with one player over two games to help him, but he kept saving up his minerals to make one higher unit, and therefore missed out on kills, and more resources, and made one of our roads weak. A fair, and a exciting game is 4v4. However when one goes Afk – and stops building more units/leaves game. Then the units can become unbalanced, and it becomes harder. Not saying a 3 people team can’t win – but it means you need to start helping out the other side more by building units on their road side. You can tell how bad/good the other side of your team is going by the tide of unit dots making their way. 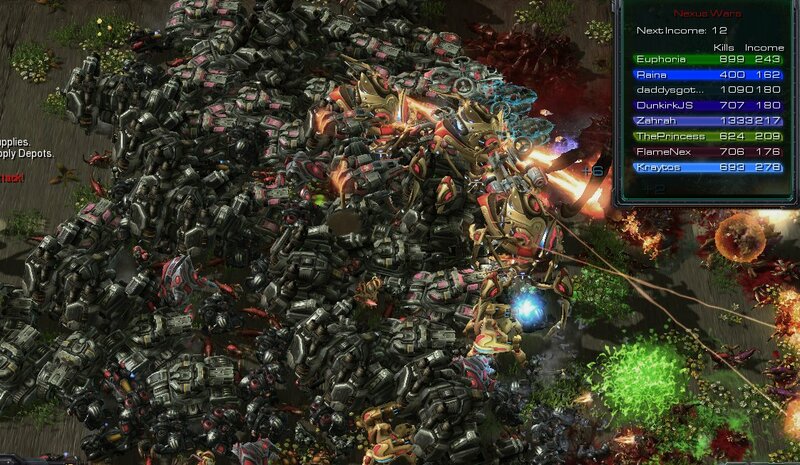 You can see if they are getting pushed back, and might need you to use your nuke, or build some units to help them out. I love it. It’s usually the top game/2nd top game on the Custom map list. I got a little frustrated in the beginning that I couldn’t control them. They are mindless minions, but that’s part of the challenge, and the design of the game. When it gets out of hand.. 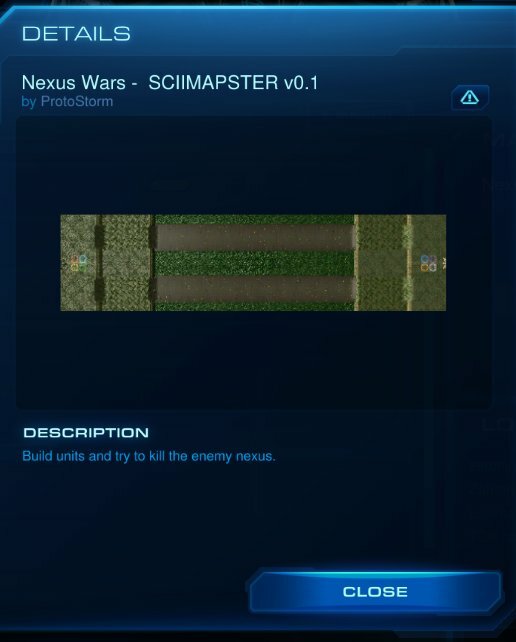 I just got into Nexus wars last night. Countering your enemy’s build seems to be a big part of it. I had one good counter where they build 10x well scyncronized marines and I went Dark Templar. With no detectors, his waves of marines quickly got countered by my powerful melée. I kinda like this map, but my computer is terrible so i can’t play it without lag. What would be really great, though, is a single player version with AI that does something, much like the AI in Castle Fight in Warcraft III.